French family of engravers. The brothers Franois de Poilly I (1623-1693) and Nicolas de Poilly (1627-1696) were sons of the Abbeville goldsmith Charles de Poilly (d. 1646). In 1638 Franois moved to Paris, where for three years he worked for the engraver and print-seller Pierre Daret, before working with Pierre Mariette I. From 1649 to 1656 he was in Rome. He was principally a reproductive engraver, at first producing devotional images for such print publishers as Mariette, and also book illustrations. In Rome he was friendly with Pierre Mignard and made engravings after Bernini, Algardi, Salvator Rosa and Carlo Maratti, as well as after Raphael, the Carracci and Guido Reni. He had remarkable skills as a draughtsman, which are apparent in his fine reproductions of the paintings of these Italian masters, as well as those of the Frenchmen Mignard, Charles Le Brun, Jacques Stella, Nicolas Poussin and others. He also made engraved portraits. From Louis XIV he received a privilège (copyright) on 24 February 1665 and the position of Graveur Ordinaire du Roi on 31 December 1669, and he attracted many talented students, among them Grard Edelinck. Changing tastes in the late 18th century and 19th, in particular the decline in popularity of engraving in favour of etching, meant that his style came to be regarded as somewhat cold and monotonous. 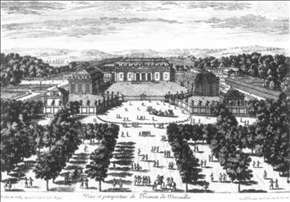 Franois et Nicolas de Poilly contributed to Paris reputation, beginning in 1630, as the capital of European engraving. See more details about "View and Perspective of the Trianon at Versailles"